Here's some sketches of the profiles with dimensions. I got bored last night and got my dial calipers out and started measuring. 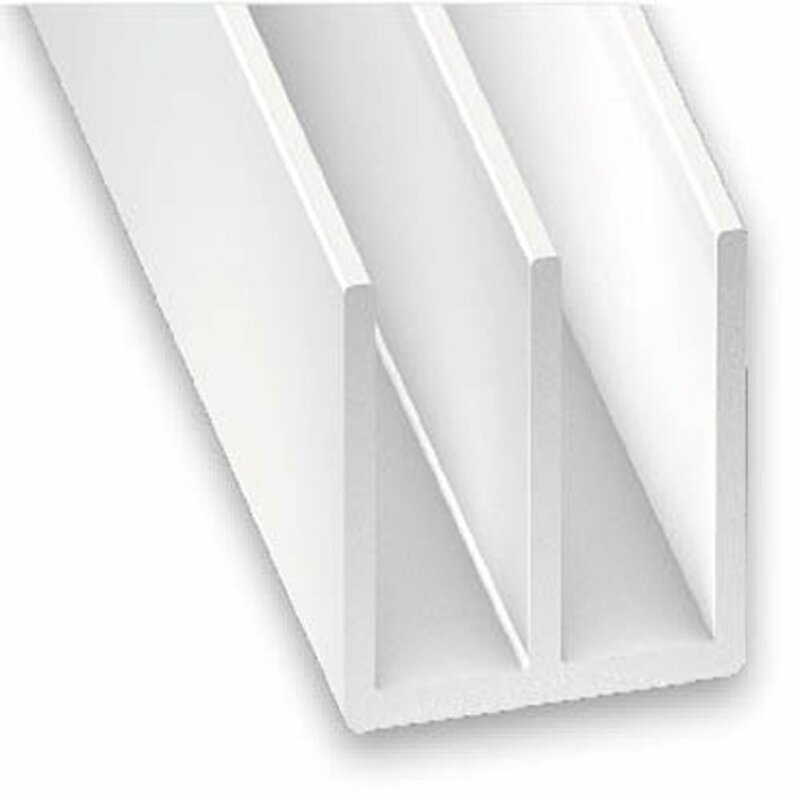 I found a profile of a window track online that has possibilities but it's definitely not an exact match. What needs to be determined is why Airstream created the profile that they did. Could you use regular twin channel tracks but cut back the second and third arms? That is similar to what I've been finding but depending on why the current extrusion is shaped like it is it may not work. The windows actually ride on the vertical uprights and not down inside the channel. Tonight I'm going to set the window and screen in place and try to get some decent pictures of what the plastic strip is actually trying to do. Bottom line is I'm doubtful that the extrusion you pictured or the one I found will actually work. Just to add to the discussion my guess is what Dave did was to use some of the really large tie wraps (i.e. 3/8" wide) and laid them on top of each other to the point they were high enough for the screen and window to slide on top of. If that actually works then maybe the easiest solution is to get a strip of delrin that is wide enough to fit inside the channel and just tall enough to match the tip of the V provided by the plastic extrusion. More later this evening. I am guessing the raised center not only gives the correct ride height but also a 'spring' rather than fixed base. If so a strip of plastic slightly wider than the bottom of the channel, with a crease down the center would work. Could also be a strip of fluoroplastic (Teflon) so it is slippery. After looking closer at the window and screen sitting in the track it appears the window and the screen actually ride in the bottom of the V grooves. I've attached a sketch of what might work as an alternative. I think what Airstream was trying to do was to create a little bit of spring in the extrusions to allow for flex of the vehicle and window frames. I'm not sure if my idea in the sketch would work but it's the first thing I'd probably try. Maybe Tony or Mike would have an idea on how to use a table saw to fabricate these from strips of nylon or delrin. The strip would start out being 1/2" square and then trimmed accordingly. Next year, once I get this Cancer monkey off my back, I plan on tackling my windows. I have everything I need to to this project. So once I take this apart I will have a better idea on what is needed to fabricate these inserts. I have worked with UHMW stuff before, but would have to find some UV resistant stuff to make them out of. Ultra high molecular polymer plastic is the way to go; super inert, super slick and almost unwearable. I might even be able to get it CNC'd, but let me get one out first and see. Actually it would be esier to have a shaper bit made up to fit the inside profile, run the UHMW sheet through the shaper then cut the molding on the saw. I got to brain storming (yeah I know, dangerous!) this evening and decided to take a crack at 3D printing the elusive window tracks for the Classic windows. There are some things the 3D printer can do pretty well, making long extrusions is NOT one of them. My printer has a max printed length of about 8". The window tracks are approximately 23.9375" long so in order to make something that would work it's going to have to be done in 3 sections that are 7.98" long. The sections would have to be screwed into place which means roughly four more screws per track. Back in post #30 I had created a profile sketch of the window track I have on hand. So this evening I spent some time with Infusion 360 and came up with a rough drawing of what the original extrusion looked like in profile. Due to the nature of 3D printing there are a couple of areas that would be difficult to print without supports (supports are areas where the 3D printer adds material for something that will overhang and is later removed from the object). One is the upper lip that hangs down and the second is the V at the bottom. The bottom V might be printable without supports but the lip would need supports included. So the first attempt is with a flat bottom and no lip. The first print looked good but after I applied some strong side pressure I was able to break the tall side wall where it joined at the bottom. So for my next iteration I tried to make the profile match the original profile as much as possible. That one turned out better but I was still able to break the side wall. My final attempt increased the side wall thickness by .020" and that seems to have worked. It appears I have the V at the bottom swapped from side to side so tomorrow I'll correct that tomorrow. With luck I'll be able to do a test fit in a spare window I have sitting in the shop in the next day or so. I probably should mention, this is not a fast process. A single 8" strip takes roughly 45 minutes to an hour to print. I can probably put up to eight of them on the bed at the same time however the print time would increase to approximately six to seven hours or so. One other thing. It should be possible to glue the three pieces together to form one long strip. Supposedly Cyanoacrylate glue works for bonding PETG pieces together. Also, this is ths perfect use of a printerbelt! I thought about printing on the Z axis as well but strength and warping worried me. It would be easy enough to try and I might try one this weekend just to find out. I'm not convinced the little vertical lip at the top is necessary. Until someone can explain to me why it's needed I'm going to leave it out. Not having the lip at the top eliminates the need for supports of any kind. I'm thinking having slightly thicker side walls would help eliminate the need for the lip. I've been looking at the profile of the original extrusion trying to discern why the shape is the way it is. There are some pretty funky grooves that don't make sense at the moment. The first thing I'm going to do is eliminate the V on the bottom and make it flat. The printer belt is really cool! Do you know if there are printer belt businesses out there that will take a g-code file or an slt file and print them? The printer belt would allow for full length extrusions without resorting to gluing the pieces together. My plan is once I have a suitable profile developed and I've made a couple of strips to put in my test window I will post the g-code files and the slt files here on Airforums and probably Thingiverse as well. More than likely I'll post the Fusion 360 files as well.